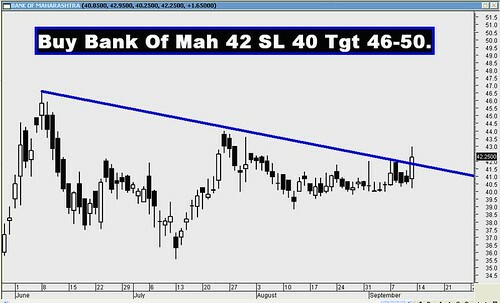 Archives : BANKING STOCKS LEAD THE UPMOVE - 11/09/2009. 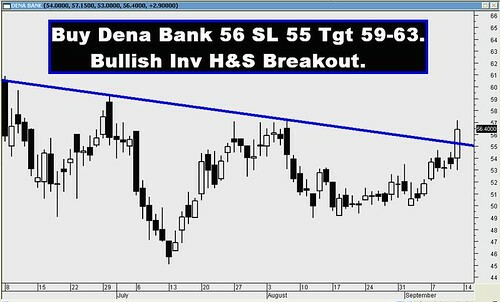 BANKING STOCKS LEAD THE UPMOVE – 11/09/2009. Last week we were expecting the Nifty to make a decisive move and it did give a Bullish Ascending Triangle breakout, when it managed a close above 4756. In the process not only the Nifty has managed a close above the previous intermittent top of 4731 but also above the 61.8% retracement of the entire fall which was at 4789. The Nifty thus will have a pattern wise target of 5103-5351 provided the support at 4665 is held. The Sensex is forming a Rising Wedge and is yet to confirm a breakout for this formation. Rising Wedge breakout will be confirmed if Sensex manages a close above 16329, then one can expect a Sensex target of 17265-17737. The Sensex opened at 15793, made a high of 16434, made a low of 15793 and closed the week at 16264. The weekly gain was 575 points. Sensex has formed a Bullish Opening White Marubuzo on the weekly charts, but on the daily charts it has formed a Doji on Friday. The Doji indicates indecision about the way forward. The Sensex opened the week with an upward gap on Monday between 15740-15793. This gap will provide support in case of a fall. Below this gap there is one more upward gap between 15275-15356 on the weekly as well as daily charts. This gap holds the key for the short term upmove. The Sensex needs to close above 16329 which will give a Bullish Rising Wedge breakout, and then the possible targets can be 17265-17737. The Trendline support is at 16013-15698. For the week ahead Sensex will face resistance at 16434-16548-16666 and support will be at 16013-15698-15356. The Nifty opened at 4682, made a high of 4889, made a low of 4679 and closed the week at 4829. The weekly gain was 149 points. Nifty has formed a Bullish Opening White Marubuzo on the weekly charts. On the daily charts it has formed a Spinning Top formation on Friday which is neutral formation and hence indecision. Nifty has managed to conquer the 61.8% retracement (4789) of the entire fall from 6357-2252. Since it has managed a close above that, the next target according to Fibonacci retracement will be 78.6% which is at 5478.. The Nifty has managed an Ascending Triangle breakout and the possible targets for these patterns will be 5103-5351. These targets can be achieved as long as the Nifty does not breach the support of 4665. The Nifty O.I.PCR is at 1.66. The high O.I.PCR indicates that more and more market participants are getting extremely bullish. Strong PUT writing is visible at the strikes of 4700 and 4600 which will provide good support in a fall. CALL writing at 4900 strike will provide resistance moving forward. The Trendline support is at 4761-4644. For the week ahead Nifty will face resistance at 4889-4957-5019 and support will be at 4761-4665-4576. Last week most of our targets were achieved except IFCI and CMC. 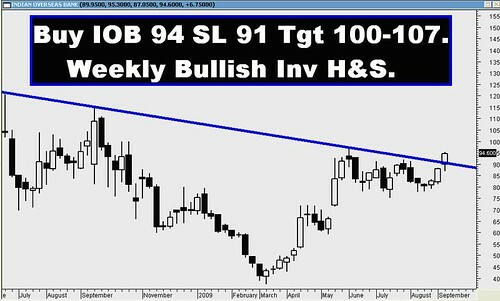 The star performer of the week was Jindal Steel which rose by 10%.